It was a gloriously sunny and balmy 38 degree Tuesday following another winter storm that shut down the city on Monday, and I got to spend it on my bike instead of in the classroom or my office. Weather de damned, it’s SPRING BREAK! After a leisurely morning reading in bed, I headed over to Federal Hill for a massage and a haircut, because why not? The ride was bracing, but it felt good to be out and about, tossing out cheery how-you-doin’s and taking lanes before circling the harbor and heading back up and over for that little bit if suburbs-in-the-city called McHenry Row. I chatted with J. at the Haircuttery about who would ever choose to live there, above the glorified strip mall, and we agreed we were fortunate not to have paid the DC rents that probably make that place seem affordable. And then it was back on the bike for a ride up to Hampden to meet S. for beer. I got sidetracked by school pick-up traffic, wondered why we can’t even collectively share the getting-to-school part of life, got huffy about the President Street bike lane, and then stopped to look up at the bird’s nest in a still-bare tree against the sky, the brick of Shot Tower above it all. So, so pretty, Baltimore. Thank you for giving me so many places to ride around, and a week off to remember where I like to go. Now if we can just get spring to hang on for a minute. This entry was posted in neighborhoods and tagged Baltimore, Shot Tower. Bookmark the permalink. 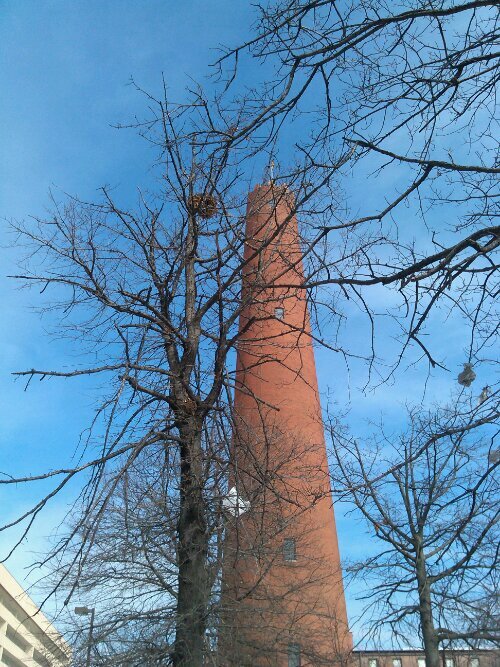 I was in Baltimore a number of years ago for a conference, and I walked over to the Shot Tower (mostly because I like towers). I also climbed up the hill to the Washington Monument, and then up the stairs inside. Claustrophobic but fun.